A smart Edwardian property in Anfield, Liverpool that's part of The Beatles Legend. Room4uu says 'Yeah, yeah, yeah'. This quirky and charmingly eccentric guest house was at one time the home of Brian Epsteins grandmother. For fans of The Beatles, Epstein needs little introduction. Epstein was The Beatles manager; the man who transformed them from four scruffy punks from the suburbs into giants of popular music. Just two miles from Liverpool City Centre and stuffed to the rafters with Beatles Memorabilia, this smart Edwardian property comprises 8 en suite guest rooms, a 24-hour front desk, a Garden and a Terrace. There is a free car park at the front of the property and an overspill car park for up to 30 cars at the rear. Fab and quite extraordinary bed breakfast guest house. Excellent base for games at Anfield which literally minutes away on foot. 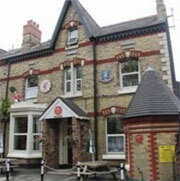 Epstein House is a 15-minute drive from Liverpool Lime Street Rail Station. The University of Liverpool can also be reached in 15 minutes by car.